U2 are on tour, and we get to go along! We are there to to help raise awareness for the fight against extreme poverty and preventable disease with U2 fans – a great bunch. We’ve made a lot of friends who have joined up with ONE! The band kicked off its iNNOCENCE + eXPERIENCE tour to a sold out crowd in Vancouver. As over 18,000 fans eagerly waited in line, an army of ONE staff and volunteers worked the crowds, engaging people of all ages to sign on to the Poverty is Sexist petition. With a booth inside the concourse and teams interacting with fans all around the arena, we managed to get our message out widely. 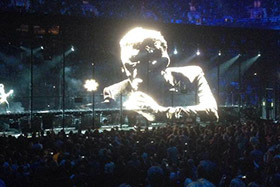 The show was a visual feast, with sophisticated technology and a remarkable stage set-up that brought a sense of intimacy to a large arena. The music was equally impressive – a 24 song setlist divided between the themes of Innocence and Experience. The encore featured a recording of Stephen Hawking on the theme “We are not the same but we are one”. And, Bono gave a shout out to the lifesaving action of Amnesty International, (RED) and ONE, with hope for an AIDS free generation. Here’s to changing the world ONE concert at a time!